You are here: Home » GENRE » Anime/manga » Pokemon Detective Pikachu (trailer: live action Pokemon film). Here’s the trailer for the live action Pokemon Detective Pikachu movie. The movie stars Ryan Reynolds as the voice of SFX’d Detective Pikachu (I can’t believe I’m writing this). In the Pokémon universe, Tim Goodman (actor Justice Smith) is a failed Pokémon Trainer and the son of detective Harry Goodman. 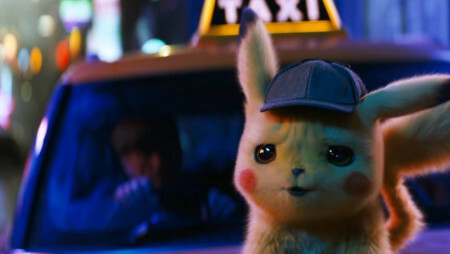 When Tim’s pops disappears in a car crash, Tim travels to Ryme City and ends up meeting Detective Pikachu (Ryan Reynolds), who was Harry’s former Pokémon partner. They team up to locate Dad and the uncover a plot that poses a terrible danger to the Pokémon universe. « SHAZAM! (new trailer for the movie).